PASCAGOULA, Miss., April 3, 2006 (PRIMEZONE) -- Northrop Grumman Corporation (NYSE:NOC) took a major step forward in Hurricane Katrina recovery efforts with the re-launch of the company's 24th Aegis guided missile destroyer, Kidd (DDG 100). The ship sustained hull damage during the storm and the shipbuilding team returned the ship to water six weeks earlier than originally scheduled. "Accomplishing such a daunting task much earlier than originally scheduled demonstrates the fighting spirit of our workforce," said Philip Teel, president of Northrop Grumman's Ship Systems sector. "The shipbuilders assigned to DDG 100 knew the significance of this project and the work that needed to be performed in a short time. The road to recovery is long, but completing this milestone shows that we are making positive steps." The ship's hull was damaged during the hurricane and took on water and some compartments were flooded, but several employees who rode the ship during the storm worked quickly to ensure the water would be contained. The shipyard workforce returned to shipbuilding in less than two weeks following the storm. Once the equipment and material were restored on DDG 100, the ship was placed on the company's drydock and the restoration began. "Today marks a rebirth in the life of Kidd and the team effort among our crew, the Supervisor of Shipbuilding and the Northrop Grumman shipbuilders made it happen," said DDG 100's prospective commanding officer, U.S. Navy Cmdr. Richard Thomas. "What the shipbuilders did to prevent further damage during Katrina was nothing short of heroic. These workers are all facing a great deal of personal adversity, but their attitudes-from apprentices to management-continue to be phenomenal. I see nothing but smiling faces and people performing hard work. It's obvious they are pouring their hearts and souls into this ship." Shipbuilders here are familiar with historic restoration efforts. 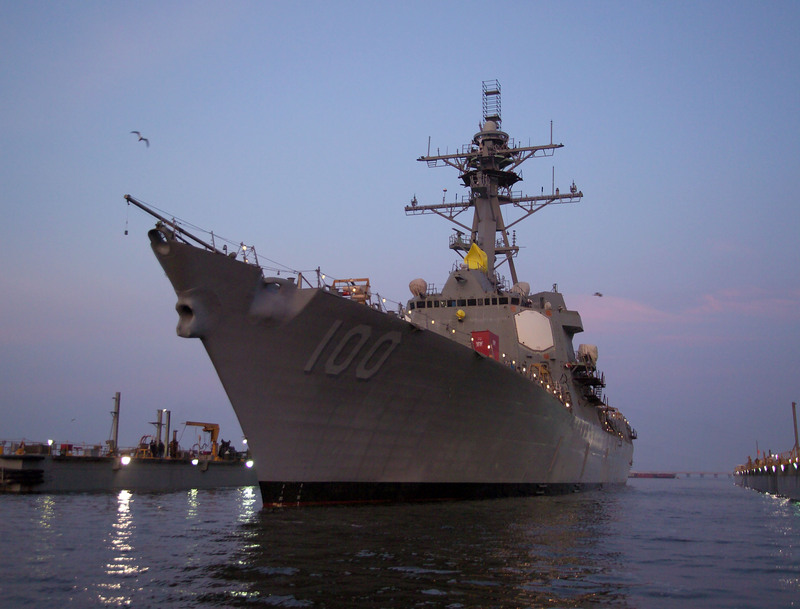 The last project of this magnitude occurred when the company restored the Aegis destroyer USS Cole (DDG 67) following a terrorist attack in Aden, Yemen in October 2000. The ship returned to the Navy fleet 18 months later. "In both of these restoration projects, every department in this shipyard took ownership," said ship coordinator Jim Taylor, who performed the same tasks on Kidd and USS Cole. "Everyone had positive momentum and that's what it took to get Cole back to the fleet and get DDG 100 in the water early." Now that DDG 100 is back in the water, more efficient and extensive construction work can be performed to move the ship closer to completion. "You cannot underestimate the importance of getting DDG 100 back pier side," said DDG production director Ron Wilson. "The ship is much easier to access when it's in the water and significant work, like testing the combat systems and running the engines, can be performed in a more efficient and timely fashion." The ship's Aegis systems will be restarted in late May and main-engine light off is scheduled for early August. The new delivery schedule will have the ship ready for the fleet by the end of the year.